Better Range, More Power and Sportier Appearance. The Nissan Motor Co., Ltd. launched what they claimed to be the world’s first affordable, zero-emission car in the form of the 2011 Leaf – a 4-door, medium-size, lithium-ion battery powered, plug-in electric hatchback, capable of comfortably transporting five adults. The Nissan Leaf is a five-passenger sedan based on a dedicated EV platform and is a 100%plug-in electric vehicle with zero emissions. There is no supplemental gasoline engine as in a Hybrid Electric vehicle, so oil changes are no longer necessary. 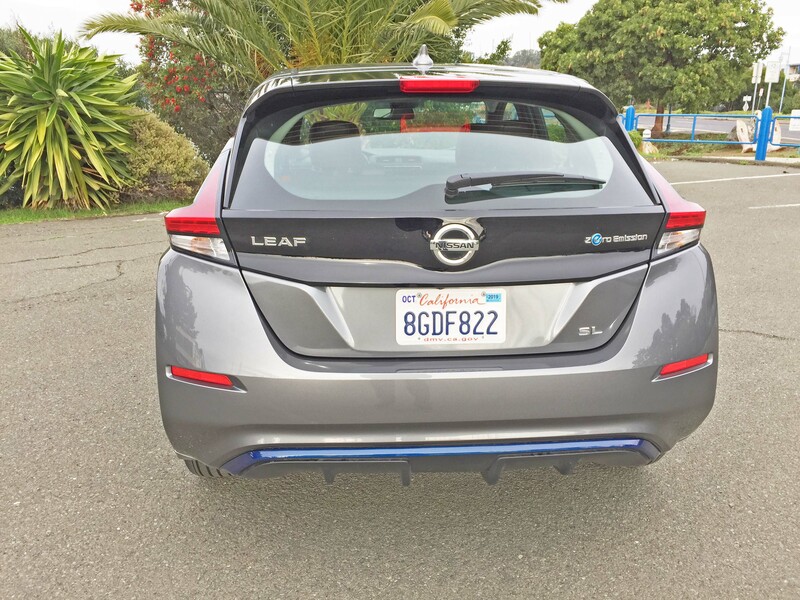 The Leaf is based on Nissan’s ”B” car platform which also supports the Versa, but is 6-inches longer. 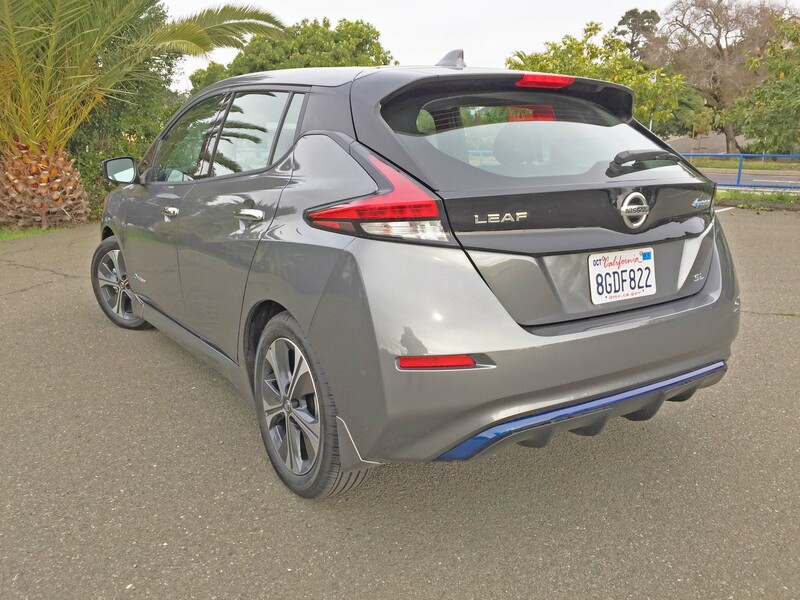 2018 marked the second generation for the Nissan Leaf and was all-new with a refreshing aerodynamic design form featuring dynamic proportions and sporting a floating roofline and Nissan’s signature V-Motion Grille with a striking Crystal Blue pyramid panel. Other signature design cues are the “Boomerang” lamps and enhanced brand symbol. 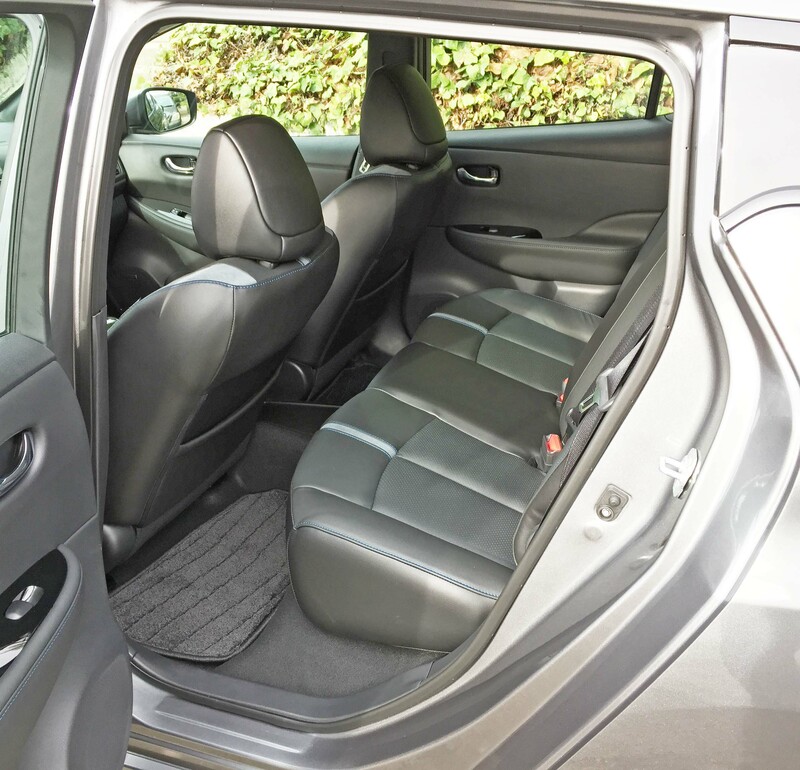 The Leaf is available in three trim levels: S; SV; and SL – the latter including leather seating surfaces. 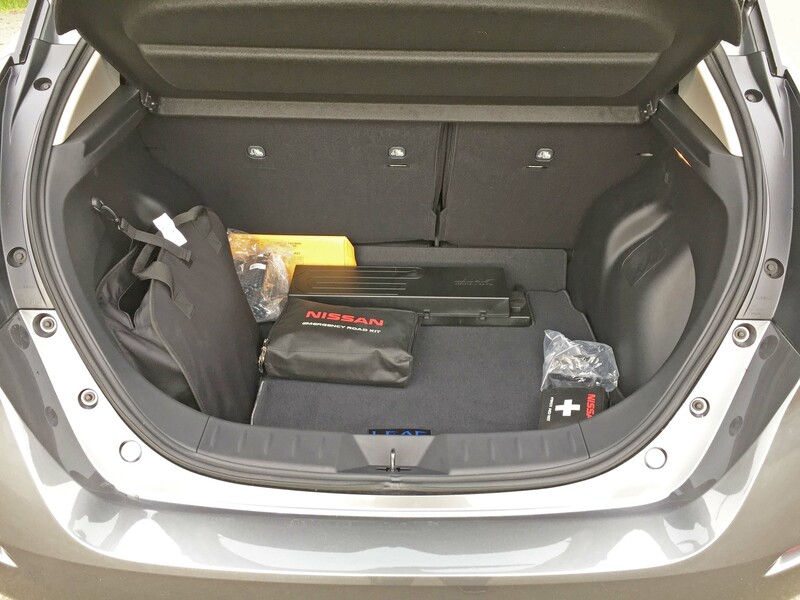 A solar panel and rear backup camera are optionally available. The SL trim level is actually priced at $590 less than the previous model and represents an increase in value of $6,783. 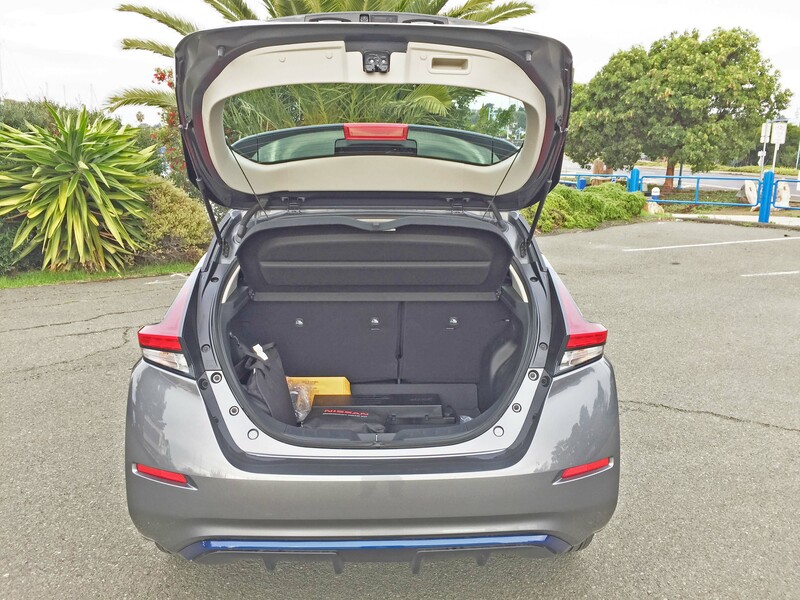 Leaf’s power comes from a 680 pound laminated Lithium-ion Manganese Graphite battery pack mounted low in the vehicle floor for optimum weight distribution, and a high-response synchronous AC electric drive motor (110kW / 147 horsepower and 236 pound feet of torque) delivering energy to the front wheels. Top speed for the Leaf is 90 mph and the EPA estimated range capability is 150 miles plus. The battery pack consists of 192 cells, with 8 laminate cells per module x 24 modules compared to the old 4 cells x 48 modules. Battery capacity decreases with time and use. Actual range will vary depending upon driving/charging habits, speed, conditions, weather, temperature, and battery age. The battery comes with an 8-year, 100,000-mile warranty, and the battery is expected to retain 70-80 percent of its original storage capacity after 10 years. 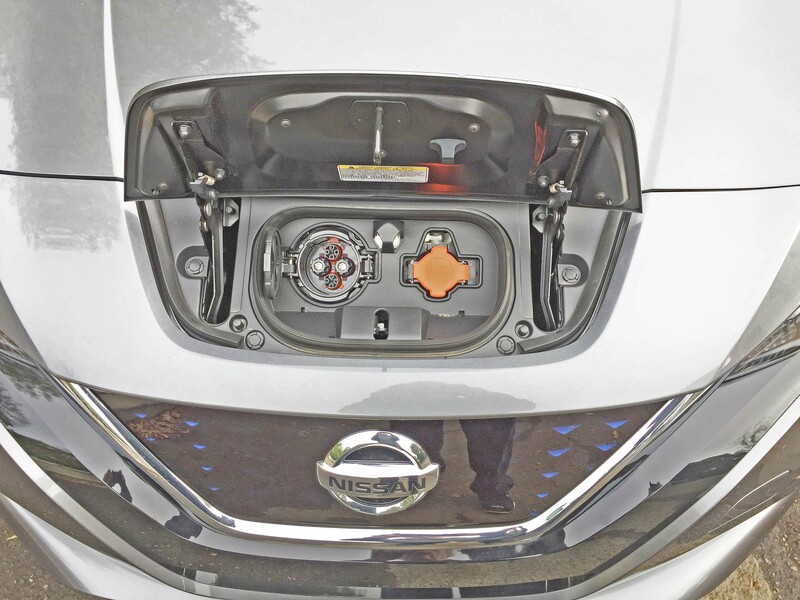 The Leaf’s charging plugs are located in a small forward compartment located just below the hood. Recharging may be accomplished via a supplied 110 V portable trickle charge cable that may be plugged into any conventional household outlet. Optional 240V charging is available. There are actually three levels of recharge technology: Level I is a 110V (30kW) trickle type that fully recharges in roughly 35 hours; Level II is the normal recharge method for both home and public usage at 3.3kW (220 V) that requires approximately 7.5 hours and which may now be done by simply plugging into a standard 220V clothes dryer plug. ; and the third level – DC Fast Charge is a quick type for public and private use at 50kW that will deliver an 80 percent charge in 40 minutes There is also a standard photovoltaic solar panel spoiler on SL models, which supports charging of the 12-volt battery for vehicle accessories. 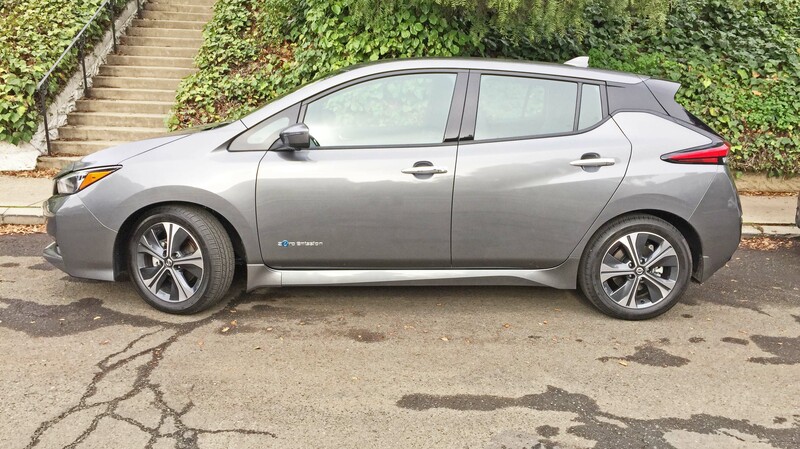 The Nissan Leaf has no gas tank, tailpipe, nor does it have a conventional transmission to complicate maintenance. In fact, the only real maintenance requirements are tire rotation and windshield wiper blade replacement. There are three operational modes: a Normal Drive mode; an Eco mode, which increases efficiency and delivers more range by reducing power output while increasing regenerative braking; and a B-mode, which aggressively engages regenerative braking during deceleration. Directional selection is accomplished via a center stack-mounted “Palm shifter” that operates on the principle of a computer mouse or joystick, and there is an eco button located on the steering wheel. The exterior styling is distinctive and is emphasized by a sharp, upright V-shaped design featuring long, upward-slanting LED headlights with a blue internal reflective appearance. At the rear, the slim-type aerodynamic vertical LED taillight design and angular corners blend with the aerodynamic muffler-less rear bumper and rear diffuser managing the aerodynamics of the rear end without sacrificing rear interior space. The drag coefficient measures only 0.28. The exterior also utilizes a flat underbody (including a large front flat floor cover, motor area undercover, front undercover and rear diffuser with fins) to help manage under vehicle airflow. Other noise reduction measures include a quiet-operation windshield wiper motor, a sound insulation windshield design and a dual-isolated motor-mounting system. The interior includes navigation as standard fare, push button start, a digital meter cluster, a remote charge status monitor and advanced user interface for range management including connectivity through both Apple CarPlay and Android Auto smart phone applications. Information screens are provided for tracking energy flow in both the Nav system and driver info display. Audio, entertainment and connectivity features have been upgraded, starting with the addition of standard NissanConnect SM with Mobile Apps with 5.0-inch color display for LEAF S models. The system includes Bluetooth® Hands-free Phone System, Streaming audio via Bluetooth®, Hands-free Text Messaging Assistant and USB connection port for iPod® interface and other compatible devices. 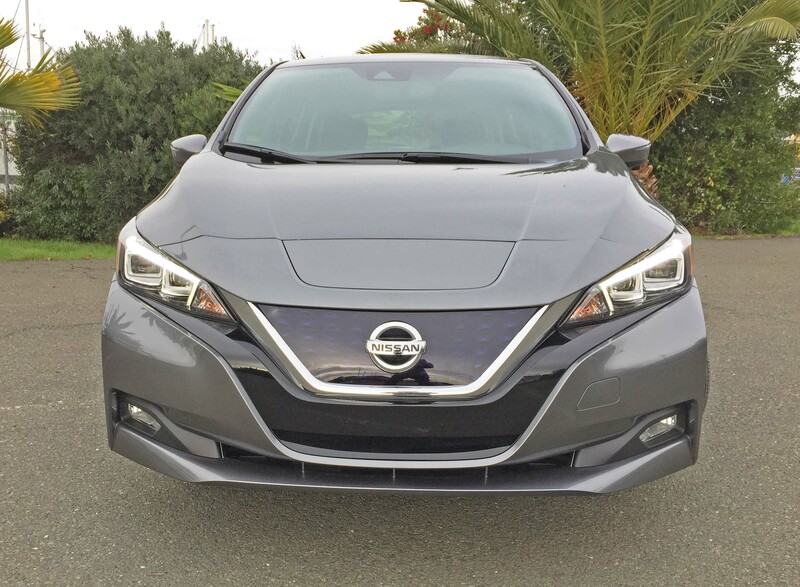 My test 2019 Nissan Leaf came in the top-of-the-line SL trim and wore a Gun Gray metallic exterior finish, with the interior done in Black The base price was set at $36,200., while the price as tested came to $38,215 after factoring in options, including the Technology Package with electronic parking brake, High Beam Assist, Automatic Emergency Braking with Pedestrian Detection, Intelligent Lane Intervention and ProPILOT™ Assist , along with Destination and Handling charge, but before factoring in any applicable tax credits and rebates. 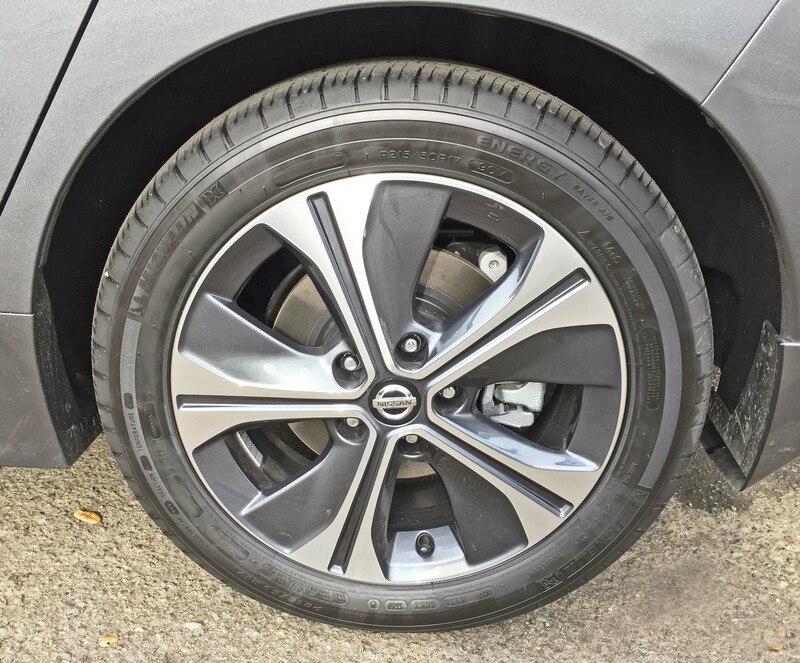 Piloting the all-new Nissan Leaf is really not a dramatically different process from driving a conventionally powered or hybrid powered vehicle, except that it is eerily quiet and when operated with the E-Pedal’s advanced one pedal operation, where braking occurs when decelerating. 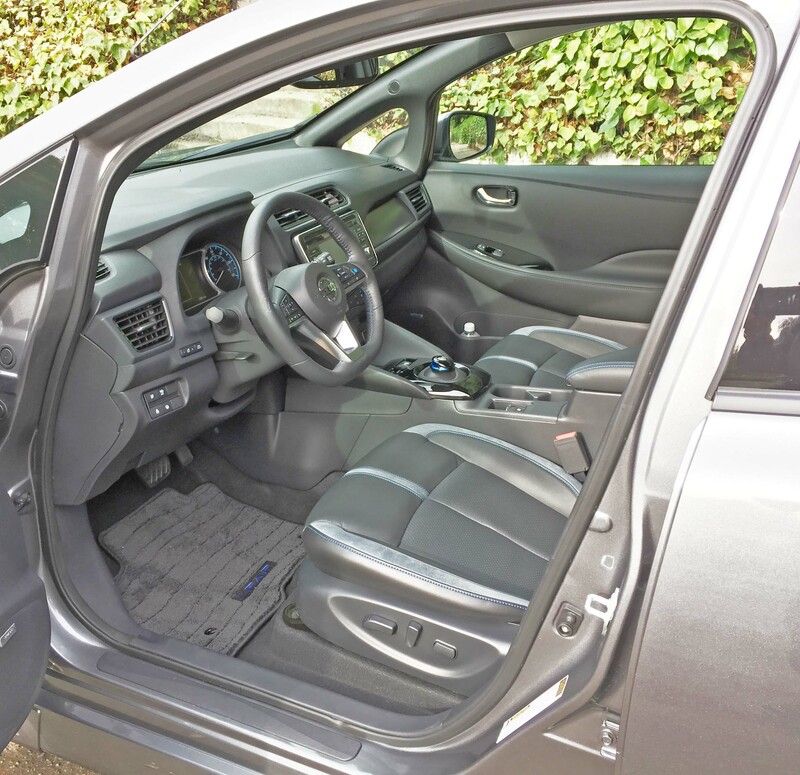 A truly one-pedal operation is possible, utilizing only the accelerator pedal. Simply lifting off the accelerator activates regenerative braking action which will even bring the vehicle to a complete stop, except in emergency situations. The ProPILOT Assist system is a “hands-on” semi-autonomous feature that performs as a steering assist for the driver with Intelligent Cruise Control and Electric Power Steering. It is not a self driving system. Acceleration is instantaneous in a luxurious silence, and the handling delivers a nimble feel. I found the Nissan Leaf to be fun, enjoyable, reliable and most of all, efficient in both normal and Eco modes. 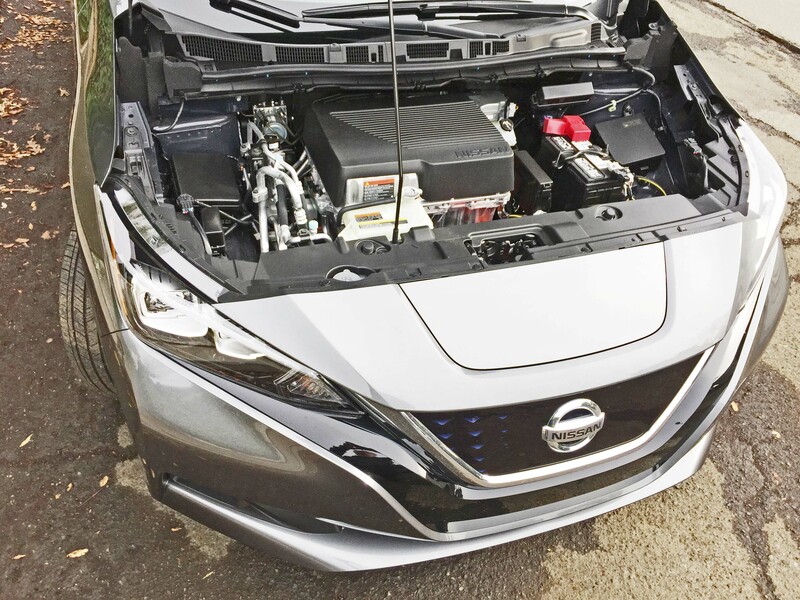 The new Leaf now delivers a 37% increase in horsepower along with a 26% in torque for enhanced performance, and it has gone from a 30 kW to a 40 kW battery using the same footprint, for a 33% increase in energy density. 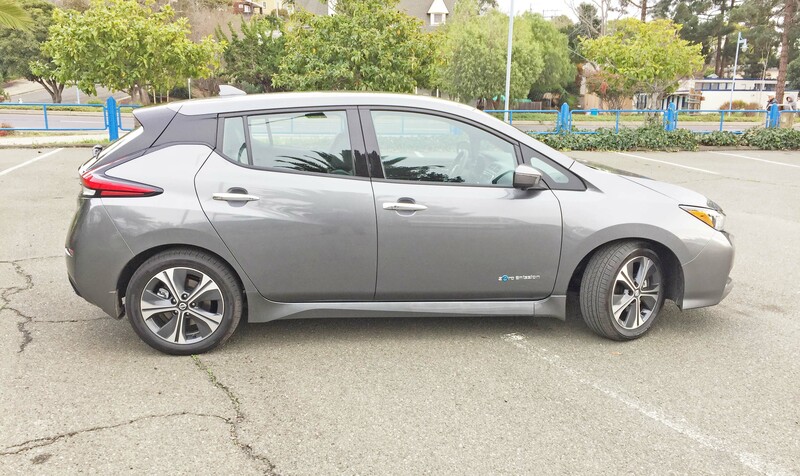 In the final analysis, given all of its advantages, the Leaf makes good sense for purchase or lease for consumers with an average commute (60 miles or less each way – more if mid-point charging is available). How can you go wrong with a longer range at a lower price point with stronger performance, a more attractive styling and enhanced technologies? Another version of the 2019 LEAF with a higher range will be introduced at a later date. Price as Tested: $38,215. – before federal tax credit, and other possible credits. Transmission: Single speed reducer with shift-by-wire drive selector. Three modes – Normal; Eco-mode; and B-mode. Also Hill Start Assist and e-Pedal with advanced 1-pedal operation). Drive Train: Transversely mounted front motor / Front-wheel drive. Suspension: Front – Independent MacPherson strut w/ coil springs and stabilizer bar. Brakes: Power-assisted Cooperative regenerative four wheel vented discs with electrically driven Intelligent Brake, 4-Wheel ABS, BA, EBD, AEB, and electronic center console, electronic toggle switch activation. Also VDC, TCS and TPMS. Tires: Michelin Energy Saver 215/50 R17 mounted on 5-spoke sculpted machine-finished aluminum with painted recess alloy wheels. <a href=”http://www.tflcar.com/wp-content/uploads/2012/08/Arv_Voss.jpg”><img class=”alignleft size-thumbnail wp-image 21472 alt=” src=”http://www.tflcar.com/wp-content/uploads/2012/08/Arv_Voss.jpg” alt=”” width=”150″ height=”144″ /></a>Arv Voss is a Northern California based freelance motoring Journalist and member and past officer of several noted Automotive Journalist organizations who contributes regularly to a number of national and international media outlets. He reviews not only cars, trucks and SUVs, but motorcycles and unusual wheeled vehicles as well.